Home » Featured » News & Updates » Black Friday Weekend Flash Sale! Thanksgiving week usually kicks off our 100 day countdown to Spring Break, and in celebration of Black Friday and Cyber Monday, we’re offering up something you won’t want to pass on. Beginning Friday, November 23rd and ending at midnight on Monday, November 26, you can save 50 percent on the current price of your Spring Break 2019 Panamaniac VIP Club Card! JUST ENTER THE PROMO CODE CYBER50 WHEN YOU GO TO BUY AND WE’LL INSTANTLY TAKE HALF OFF THE PRICE! 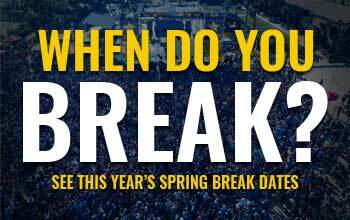 This is a HUGE opportunity to really save on your Spring Break for next year. Don’t blow this! With winter about to bear down hard, it’s easy to cope with the low temperatures by imagining yourself on the warm shores of a Spring Break paradise. Fortunately, Spring Break is just over three months away, which means planning for your getaway should start sooner rather than later. For most college students, finding the right trip means not breaking the bank, so starting early is key in order to find the best deals for your budget. That’s why Friday-Monday is such an important time for you if you’re planning on joining us this March! It’s so big, we can’t say anything more. Make sure to check back here this weekend! !